Why ignoring paid domestic violence leave comes at a serious cost for victims. The statistics on violence against women in Australia are shocking. Women are five times more likely than men to require medical attention or hospitalisation as a result of intimate partner violence and five times more likely to report fearing for their lives. Half of victims have children in their care. And there is evidence that women with disabilities experience high levels of violence and that Indigenous women experience higher rates of more severe forms of violence than the rest of the population. Domestic violence is the leading cause of death, disability and illness among women aged 15-44 years – higher than motor vehicle accidents, blood pressure or smoking. It destroys individuals, families and communities. It also costs the Australian economy around 1 percent of GDP annually in lost productivity and other costs. The Australian Bureau of Statistics estimates that around two thirds of women who experience domestic violence are in the workforce. That means that more than 800,000 women– or around one in six women workers – are experiencing some form of violence in their home. Given these numbers, it is clear that a large number of workplaces employ women who are experiencing domestic violence. Apart from the personal impact of violence, there are costs to employers when a worker is living with violence. These include increased absenteeism and staff turnover, decreased performance and productivity, conflict among workers and safety issues for everyone if the perpetrator of violence goes to the workplace – which we know occurs at alarming rates. In a report into the economic aspects of domestic violence leave by the Australia Institute, Dr Jim Stanford confirmed what domestic violence counsellors have been saying for decades – that economic insecurity is one of the most significant obstacles confronting women in their decision to leave a violent relationship. 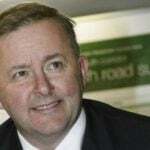 Anthony Albanese MP. Image via Facebook. Introducing paid domestic violence leave into the National Employment Standards offers an important opportunity to reach people living with violence and to provide them with support. And it makes a clear and authoritative statement that domestic violence is not acceptable in any workplace or in our society. The current Federal Government does not support paid domestic violence leave. Senator Mathias Cormann, says that domestic violence leave is just “another cost on our economy that will have an impact on our international competitiveness.” The Minister for Women, Michaelia Cash says that paid domestic violence leave is a “perverse disincentive’’, leading to women not getting jobs. And this Government is actively removing access to this vital, life-saving workplace right from the agreements covering its own employees. These ill-informed claims and actions by the government are dangerous and negligent. It&apos;s time they stepped back and had a rethink on an issue that should be well above politics. Stanford’s report calculates the cost of providing every worker access to 10 days paid domestic violence leave to be less than one hundredth of a percent of last year&apos;s increase in average weekly wages. That is a cost to employers of just five cents per worker per day. Minister for Women, Senator Michaelia Cash calls domestic violence leave "perverse disincentive". Image via Facebook. The idea that this would even be noticed internationally, let alone undermine our "competitiveness," is extraordinary. Some of Australia’s most successful and profitable businesses have introduced paid domestic violence leave. These include QANTAS, IKEA, NAB, WESTPAC, Woolworths and Telstra. The costs, even to small employers, would be offset by benefits, including reduced turnover and improved productivity. Make no mistake – not paying domestic violence leave is not free. The cost to those experiencing family violence, predominantly women and their children, is so much more, and surely one that the Australian Government must act to rectify. Like every other major social and economic reform there will always be those who claim that it is impossible or will damage business. The reality is the cost of inaction is too high. In its findings, the recent Victorian Royal Commission into the family violence found that the problem shames us all. It affects individuals, the community and ultimately, our nation. It’s 2017. There are no more excuses. Anthony Albanese MP is the Federal Labor Member for Grayndler.